The promise of internet video on demand seems to be close to fulfillment. So far, it seems that various events are available to view “on demand, on line” (OK, so far, only soccer games, but what else is so important besides bike racing?) at my convenience. 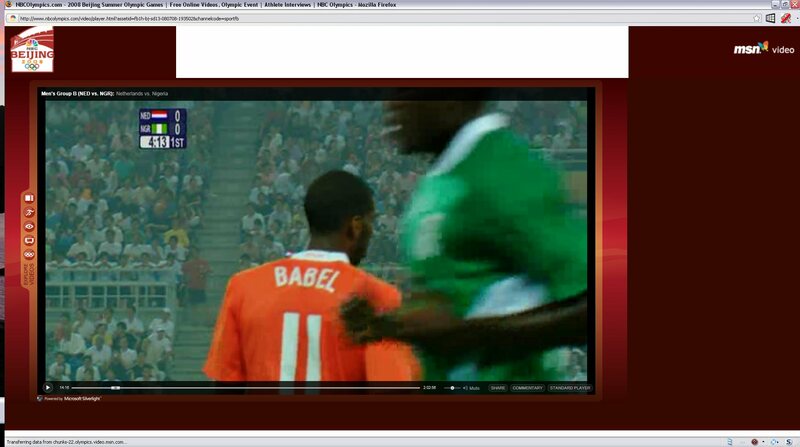 And note, I enjoyed watching the Dutch play Nigeria without a voice over announcing what I could see for myself, and without promo and popup adds. It seems that nbc has put the raw feeds from the venues on their web site ( http://www.nbcolympics.com/video/index.html ) for your enjoyment. Check it out. Silverlight is only available for the major browsers (IE, FF, Safari) on Windows or OSX. Sorry Linux fans, can’t watch on that OS. Silverlight locks down the content with DRM, so you can’t save it locally without some hacks that I haven’t yet researched. I guess I should research this, but it seems I couldn’t burn this to DVD for archiving. There is no full screen mode. i repeat, THERE IS NO FULL SCREEN MODE. So the screen shot is the best I could do to watch it on the TV from my easy chair. I couldn’t get the stuff above the viewer “off screen,” but thanks to Firefox 3 I could zoom the image to take up more screen real estate. I estimate that on the TV I could use about half of the available pixels before I zoomed the lower part of the content off the screen. But, I could pause, rewind, and fast forward, adjust the volume, etc. And by the way, with the stadium sound pumped from the computer into the stereo in the living room, it did sound a lot like I was in the stadium. Now, if they really cache the full bike race, and other full events, I won’t need to watch the evening shows much. I might avoid all that endless talking head filler that always gets in the way of the Olympics.